A recent article by United Methodist News Service reporter Heather Hahn deserves close attention as United Methodists ponder their options after the tumultuous special General Conference earlier this year. According to Hahn, The United Methodist Church’s financial and administrative bodies have proposed a drastic 18.3 percent cut to the church’s 2021-2024 general budget. The General Council on Finance and Administration (GCFA) and the Connectional Table jointly propose the budget to the General Conference. The Connectional Table is responsible for recommending how the proposed budget should be allocated among the denomination’s various boards and agencies. The budget proposal, if approved by the 2020 General Conference delegates, would take the budget down to $493.8 million, a reduction of $110.2 million from what was approved at the 2016 General Conference for the 2017-2020 period. If the recommendation is approved, it will mark the first time since 1992 that the general budget has been under $500 million. Citing the work of its Economic Advisory Committee, a group of United Methodist financial analysts, GCFA’s board said the proposed cuts are necessary. The committee noted average worship attendance at local UM churches in the U.S. continues to decline at an accelerating pace, and fallout from the special General Conference in St. Louis, Missouri, earlier this year will impact giving going forward. 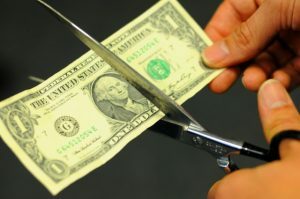 Based on developments since the meeting in St. Louis, the bodies might need to propose further cuts before the next General Conference meets in Minneapolis, Minnesota, May 5 – 15, 2020. Recently, some progressive United Methodists, angered by the passage of a plan to enhance accountability around the church’s sexual ethics, teachings on marriage, and ordination standards, have called on laity and local congregations to withhold funds from the general church as a way of protesting the outcome. Progressive pastors and laity have said they will not fund a church they believe unjustifiably discriminates against people who identify as lesbian, gay, transgendered or bisexual. According to a March 29, 2019, Washington Post article, the Rev. Adam Hamilton, lead pastor at the largest UM local church in the U.S., said a group of large, centrist churches might cut off their funding to the denomination as well. Their goal would be aimed at General Conference delegates from Africa and Russia, who support the denomination’s traditional teachings and also receive significant financial support from it. According to the Post article, Hamilton and others want to pressure the Africans and Russians to vote differently in 2020 in order to preserve funding for their mission projects. And noting that some bishops and official church bodies have indicated their unwillingness to abide by the will of the General Conference, traditionalist United Methodists have, for some time, called for withholding funds from the general church. They argue it is unethical to support church leaders and officials who refuse to abide by its teachings and the authority of the General Conference, the only body empowered to establish its doctrine and discipline. All of this comes on top of rapidly sinking average worship attendance at many local UM churches in the U.S. Since the turn of the century nearly one million fewer people worship in UM local churches on any given weekend. This has led to local church closures, the merging of districts and annual conferences, and staff reductions at every level of the denomination. The slide in average U.S. worship attendance can be traced to a variety causes, but pastors across the theological spectrum indicate individuals and families have reported leaving their congregations because of the church’s acrimonious and increasingly public debate over its sexual ethics, teachings on marriage, and ordination standards. The past four reports on U.S. worship attendance have set one record after another. The most recent report available indicated over 100,000 people stopped attending local UM churches between 2016 and 2017. As recently at 2011 average worship attendance stood at 3.02 million, but by 2017 it had fallen to 2.56 million, for a loss of 15.2 percent or 460,000 attendees in just six years. This period coincides with high profile stories of unaddressed acts of defiance in the UM Church that have garnered major media attention. Over the years UM bishops, centrists and progressives have rebuffed calls for dividing the denomination into two or more different denominations, but some are now showing greater openness to the idea. Given the dramatic decline in worship attendance, the proposed drastic budget cuts, and a bitter debate that has deepened the discord in the church, perhaps now is the time to seriously consider separation as the most God honoring way forward. A false “unity” is clearly not working.